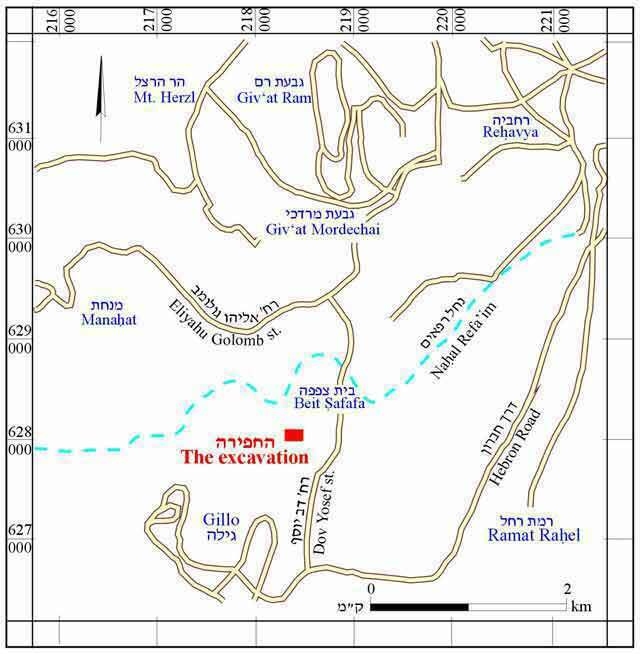 During March 2007, a trial excavation was conducted in the Sharafet village in south Jerusalem (Permit No. A-5074; map ref. NIG 218339–49/627963–71; OIG 168339–49/127963–71). The excavation, undertaken on behalf of the Israel Antiquities Authority and underwritten by the contractor, was directed by N. Agha, with the assistance of Y. Ohayon and R. Abu Halaf (administration), A. Hajian (surveying), T. Sagiv (field photography), Z. Adawi and B. Touri (administrative and logistic assistance), R. Vinitsky (metallurgical laboratory), C. Hersch (pottery drawing) and R. Kool (numismatics). The excavation was carried out in farmland where terraces are located, along a northern slope that descends to Nahal Refa’im and west of the road leading to Gillo (Fig. 1). 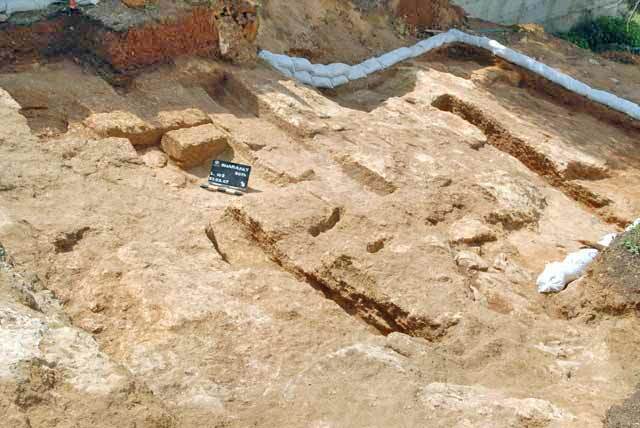 Two strata, which consisted of terraces from the twentieth century CE (Stratum I) and a quarry and a rock-hewn installation (Stratum II), were identified. Two terrace walls, 6 m apart (W1, W3; length 9 m, width 1 m; Fig. 2) that were built of two rows of large fieldstones founded on bedrock and a core of small and medium-sized fieldstones were exposed. A section of another wall (W2) and a staircase (width 1 m) built of dressed stones next to it was discovered between Walls 1 and 3. Similar steps were exposed in the middle of W3 and it seems that they were used to pass from one terrace to the other. A natural underground cavity (L110; 1.0 × 1.5 m) was exposed near W2. The soil fill of the terrace (Loci 102 and 106) contained potsherds from different periods, including holemouth jars (Fig. 3:1, 2) from the end of the Iron Age, a jar (Fig. 3:3) from the Hellenistic period, a jar (Fig. 3:4) from the Early Roman period (first century BCE) and a bowl (Fig. 3:5) from the Late Roman period (third–fourth centuries CE). In addition, a Hasmonean coin was found (IAA 107172). A quarry (L112; Fig. 4) that consisted of the negatives of masonry stones (average size 0.5 × 1.0 m) that had been extracted and transported, hewn channels (Loci 108, 111) and a circular installation (L109) was revealed. A concentration of quarrying debris (L103; 1.6 × 1.8 m) that rested directly on the negatives of the stones (L112) was exposed in the center of the southeastern area. Of the extracted masonry stones, a single one (0.35 × 0.40 × 0.70 m; Fig. 5) had remained in situ and was surrounded by severance channels. Another severance channel (L111; 0.35 × 0.40 × 2.80 m), aligned east-west, was identified east of L112. The quarry extended farther to the northwest, beyond W3, in an area where another severance channel (L108; 0.4 × 0.6 × 3.8 m) was exposed. Next to it was a round, non-plastered installation (L109; diam. 1 m, depth 0.15–0.40 m; Fig. 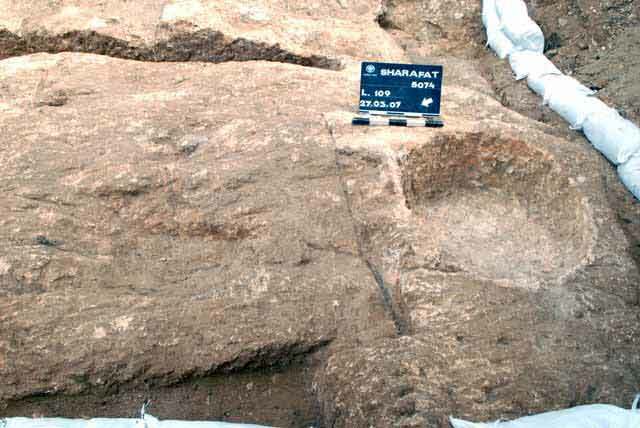 6) whose function is unclear, although it may have been a collecting vat of a winepress whose treading floor was part of the rock-hewn surface (L113; 1.5 × 1.7 m). 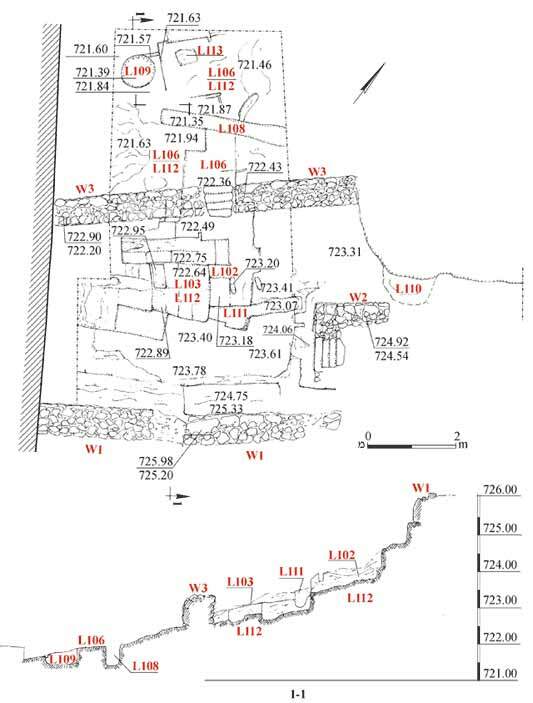 The terrace compound (Stratum I) was apparently part of the agricultural periphery of the Arab villages of Sharafat or Beit Safafa in the last one hundred years. 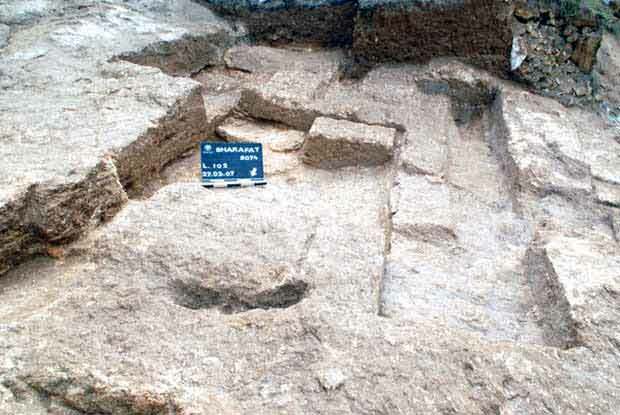 Stratum II, which includes a ‘step quarry’ and a winepress, should be ascribed to the Roman–Byzantine occupation phase in the region. The fill in the terrace does not enable the dating the quarry; however, the ceramic finds and the single Hasmonean coin correspond to the time of its operation during the Hellenistic and Roman periods. A ritual bath (miqwe) had previously been documented near the site (D. Amit, 1994. Ritual Baths in the Hebron Hill Country: Landmarks for Reconstructing the Jewish Settlement during the Time of the Second Temple. Studies of Judea and Samaria, Proceedings of the Third Conference, pp. 161–162 [Hebrew]; A. Kloner 2000. Survey of Jerusalem: The Southern Sector, Site  87) and a burial field that dated to the Early Roman period was excavated (ESI 18:94–95; Survey of Jerusalem: The Southern Sector, Site  44). 5. Masonry stone surrounded by severance channels, looking south. 6. Round installation, looking east.